A journalist who worked his way up from apprentice compositor to chief reporter has died aged 71. Tributes have been paid to Pete Lammas, who worked for the Bromsgrove Advertiser and Messenger for 50 years. Known as ‘Mr Bromsgrove’, Pete also spent six years as a Conservative councillor in the town after his retirement in 2009. His widow Kath, 67, said in doing so he had “just wanted to carry on doing the same things he did in the newspaper – helping the people of Bromsgrove”. She added: “He started from humble beginnings and never thought he would get a job in Bromsgrove as a chief reporter. He was very proud of Bromsgrove. Pete started out as an apprentice compositor with the Messenger aged 15 after leaving school. After it was purchased by the Berrow’s Organisation, he moved to Worcester to produce the paper and other weekly titles, before retraining as a journalist for the Messenger in 1988. Pete’s former editor Mark Whitehouse, who worked with him from 1997 to 2001, said: “He was a great guy, a friendly face, and a wise man with a good sense of humour. “He was affectionately known as Mr Bromsgrove and rightly so. He knew everyone and more importantly everyone knew him. “He was a nice guy and a family guy. He was a great smiler and was really good company. He always had something interesting to say or knew something interesting. Pete is survived by Kath, their children Andrew, Heidi, and Julie, and grandchildren James, Rebecca, Peter, and Joseph. He died on 22 October after a short illness, and his funeral was held yesterday. Sad news. Pete was one of the best weekly journalists of his time. He was never happy until he got the full story, but always did it with a smile on his face. Many cub reporters owe him a lot. I was so sorry to hear this sad news about Pete. Whenever he went out of the office he took so long to walk up Bromsgrove High Street as so many people stopped to talk to him and he always returned with a load of stories. He was an inspiration to the young journalists on the paper, a great ambassador for the Advertiser/Messenger and a lovely person. ‘Mr Bromsgrove’ will be sadly missed. 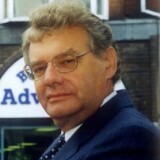 John Butterworth, Advertiser/Messenger editor 1989-97.